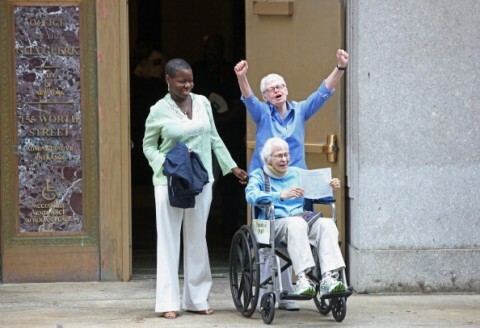 and i would have to agree…that is the happiest gay marriage photo i have ever seen. looking at these beautiful women expressing their joy made me tear up. and i thought, that is the happiest marriage photo i have ever seen…period. gay or not gay, i’ve never seen such joy in a marriage picture. i could go on and on about how marriage is a right we all should have, how being gay is not immoral…in fact it’s a natural occurring human characteristic. some of us are born blond, some of us are born brunette…some of us are born gay, some of us are born straight. about how people should stop using jesus’ name…or anyone else’s…to spread such hatred and small minded ridiculousness. about how none of us are better than the other of us. about how we should all aspire to feel such love…the love we see in this picture above. this is what some people are trying to stop…this joy…this love. about how love will always eventually win….but instead, i’m just going to post this slideshow below and hope each and every one of you one day experiences what they are feeling. i never watch the news anymore, for a whole variety of reasons, the most prominent being that i don’t want to be exposed to the barrage of negativity. but the night before last i fell asleep on the couch while i was watching something on tv, and woke up to the news of what happened in norway. don’t get me wrong, i know when something “big” happens in the world. someone will tell me and then i choose whether to read about it or not. i usually choose not to. i made a different choice yesterday and read all about the shooting…looked at pictures and obviously, it was horrifying. as i took in all this information, i found myself feeling like i had been sheltering myself from a truth…the truth that people are really monsters. this idea disturbed me. i am not one to hide my head in the sand. i have a positive outlook on life because it is what i truly believe, not because i am a pollyanna. i feel i have come to the conclusions i have based on facts and my experiences, which at times have not been pretty. still, the truth has remained the same for me…that people are inherently good. but yesterday as i digested all this horror, i considered the fact that i just might be wrong about that. that, in fact, people are horrible and will do atrocious things to one another. then i came across this picture. 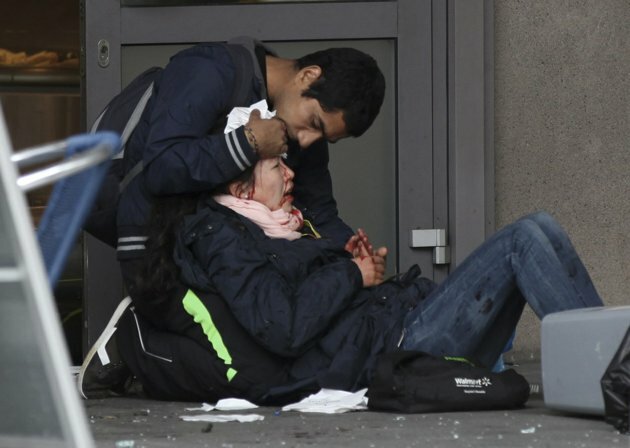 this is a picture of a passerby comforting a victim of the bombing in oslo. one person comforting another. a stranger who stopped to help. from what i read, it seems that the authorities think the bombing and the shootings were carried out by one person…just one. and i began to think about the contrast of one person, what one person can do…what one person is capable of. one person. it might be true that one person is responsible for these horrific acts. if so, we can see that one person can kill many, many people in a short period of time. one person can hurt so many…just one person…they can cause so much pain and hurt. but conversely, what affect does just one person have “for good”? we see one small example in the picture above of one person and what they choose to do with their power in the world…and often we don’t ever see the good that people do or the powerful effects that these acts have. is the person who hurts more powerful then the person who helps? i would argue no. certainly violence, confusion and hatred are much louder forces, but they are temporary. compassion, understanding and love are much stronger for that is who we truly are. the horrific acts of violence go so much against our true nature, which is inherently good, that they have a huge impact on us. they shock us into a distorted way of thinking. i have been guilty of this distortion also. i have been guilty of only looking at the horror that one person can do, vs. the healing another can do. can one person do things that are so inhumane, that they are beyond comprehension to the rest of us? yes. but i will ask you…how many people don’t do such things? if it’s true that one person is responsible for the attacks in norway, how many people didn’t kill people in norway the other day? how many people ran to help those who were hurt after the attacks? the ratio is really staggering if you think about it. this can be said in pretty much any act of violence. most of us are peaceful. many more people run to help others vs. trying to hurt them. it is our true nature to be peaceful..to reach out and support each other…to love…to connect. sometimes in nature, including humans, things go wrong…we don’t get what we need, or we are born with a mental illness. this leaves us confused and disconnected from our true nature. but these few people who are lost and sick, they don’t represent the masses. to extrapolate that on to the human race is quite illogical actually, but that doesn’t stop us from jumping to the incorrect conclusion that people are monsters when we see the horrors that someone is capable of. when you think of what we all are capable of doing to each other, how much we can hurt each other, but almost none of us do…can’t you see how “good” we really are? yes, i’m talking to you.